Paul Ajosshi: Least Convenient Toilet Ever? I love popping into the Gasum Lounge near Hangangjin station. It's an odd little art cafe that serves a decent hot chocolate and has its own stuffed goat. 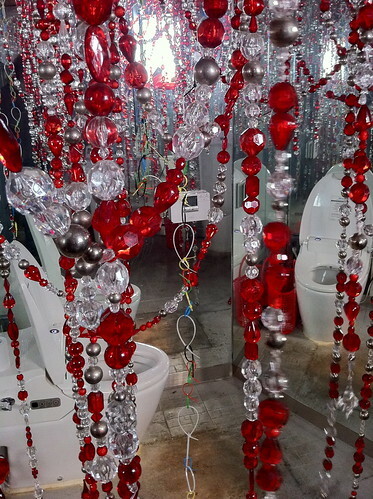 But best of all, it has the greatest obstacle filled toilet ever... You must negotiate the heavy glass beads as they bang against you and the fully mirrored walls. A challenge, especially for those who may have imbibed something a little stronger than hot chocolate. The Gasum lounge offers something a little out of the ordinary and is well worth a visit if you're in the area. Head out of Hangangjin station, past Passion Five and Edward Kwon's Spice, turn left and Gasum Lounge is on the right hand side. Is this the only bathroom in the place? I wonder if it is the same in the ladies room? 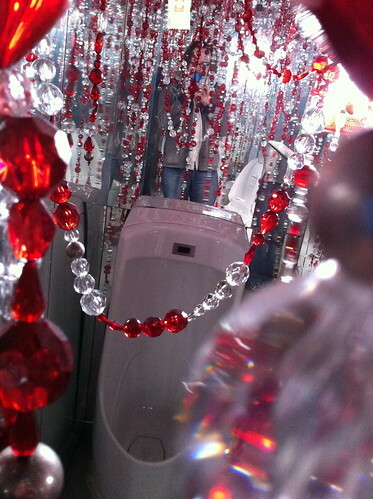 Yes, it's the only bathroom in the cafe. A challenge to every customer!